President Ram Nath Kovind approves disqualification of 20 AAP MLAs as per recommendations of Election Commission for holding office of profit. As per as the special provisions for Delhi enlisted under Article 239AA of the Indian Constitution, the number of Cabinet Ministers in a government cannot exceed 10 percent of the total membership of the Legislative Assembly. Hence Delhi has 7 ministers for its 70 MLAs. Parliament Secretaries act as Secretaries to the appointed ministers in the government and hold posts equivalent to a minister of state. As of now, only one Parliamentary Secretary to the Chief Minister is authorised by law. 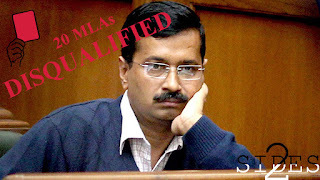 The AAP government appointed 21 Parliament secretaries - 3 for each minister, and on June 19, 2015, the Delhi Legislative Assembly passed a bill exempting the post of Parliamentary Secretary from an “office of profit”. Initially a young lawyer, Prashant Patel and later on the Delhi Congress President Ajay Maken had petitioned against the AAP MLAs. By constitutional procedure, if there is any petition to the president pertaining to an office of profit, he or she must check Article 102 and 91 of the constitution, Section 15 of the National Capital Territory of Delhi Act 1991 and consult the views of the Election Commission. In the chain of events that followed, the aforementioned bill was blocked by the President,the appointments were scrapped and the EC started an investigation, leading to the recommendation that the 20 AAP Parliamentary secretaries who held posts between March 13, 2015 and September 8, 2016 should be disqualified. The President is bound by law to act in accordance with the Poll Commission’s recommendations. The posts do exist in various states at present, including Gujarat, Punjab and Rajasthan — places where the BJP is in power. It was also argued that the previous Congress-led Sheila Dikshit government too had appointed Parliamentary Secretaries. Terming the disqualification a witch hunt based solely on a political vendetta, the AAP has accused the BJP government at the Centre of infringing on India's federal structure. They also launched a scathing attack on retiring Chief Election Commissioner A K Joti, alleging that he was “repaying the debt” to Prime Minister Narendra Modi under whom he was Principal Secretary in the Gujarat government. Seven of the disqualified MLAs have moved the High Court against the Election Commission's recommendation contending that they were not given an opportunity by the Election Panel to defend themselves. The AAP also claims that the claim of holding “Offices of Profit” is false as none of the 20 MLAs had drawn a salary in their position as Parliament Secretary, nor had utilized any perks like travel, accommodation etc. The AAP appointments to the posts of Parliamentary Secretaries were made before the Bill exempting the post from office of profit, was passed in the legislature. Thus, at the time of appointment, the position of Parliamentary Secretary was an office of profit. The argument that the posts carry no salary or monetary compensation is frivolous as they carry some perks, prestige, status, access to information locked in ministerial secrecy and power of influence through proximity with ministers. The Delhi Government ignored the precedents involving scrapping of appointments of Parliamentary Secretary by various High Courts including Himachal Pradesh in 2005, Goa in 2009, West Bengal in June 2015 etc. Responding to allegations that the Election Commission (EC) finalized its opinion in the office of profit matter against 20 AAP MLAs without hearing their arguments on the merits of the case, the new Chief Election Commissioner (CEC) Om Prakash Rawat said on Monday that the party(AAP) had been given two opportunities to request the EC to hold hearings, but they did not. Delhi BJP Chief Manoj Tiwari lauded the Commission’s action, terming it a “moral defeat” for Delhi CM Arvind Kejriwal and that he should resign.